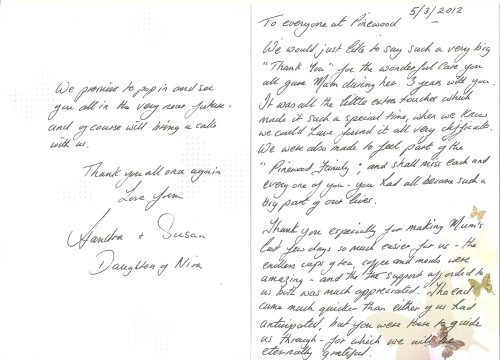 Below are a selection of letters and cards from various residents and their families. Please click on the thumbnail images to view the original documents. Everyone has been very good and I have enjoyed myself very much. My present was lovely, Thank you. I would like to say I have enjoyed today & my present was very very good. 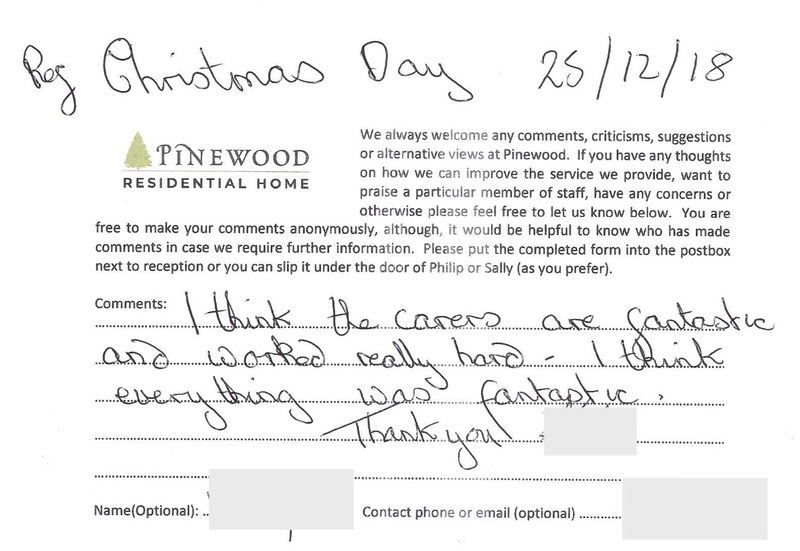 I think the carers are fantastic and worked really hard. I think everything was fantastic. December 2018. To all the staff at Pinewood. 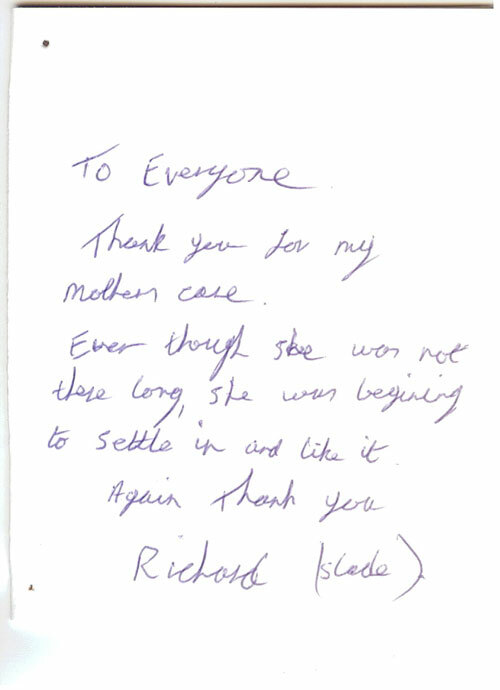 Thank you all so much for all you did for mum during her last days, you have restored my faith in care homes! We would like to thank you all very much for the care you gave to mum and the kindness you showed her whilst she was with you. 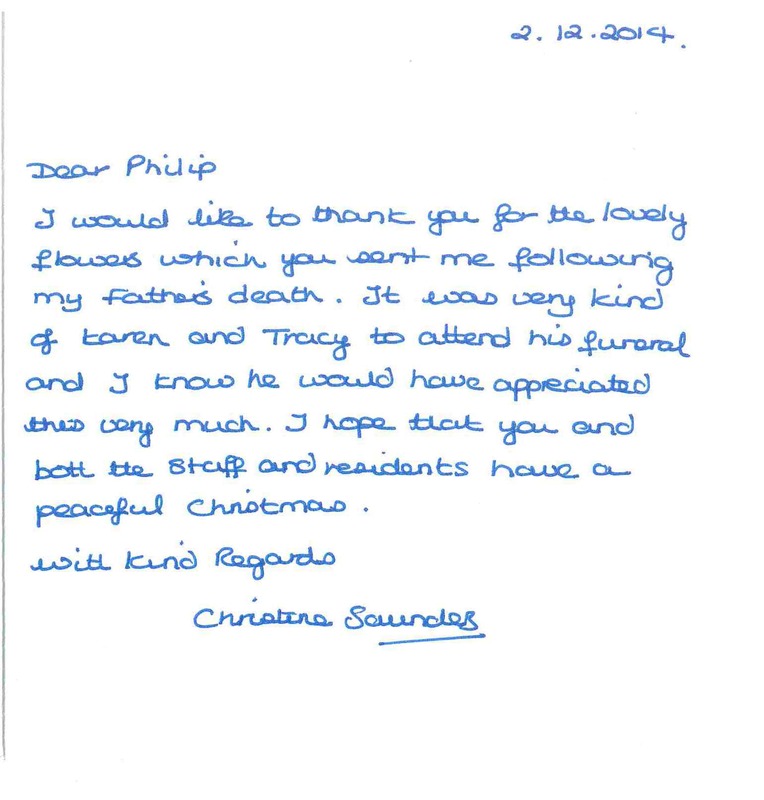 She loved to go on the minibus trips with Pat and loved to join in the activities with Lisa, she also very much enjoyed the entertainers that came in. 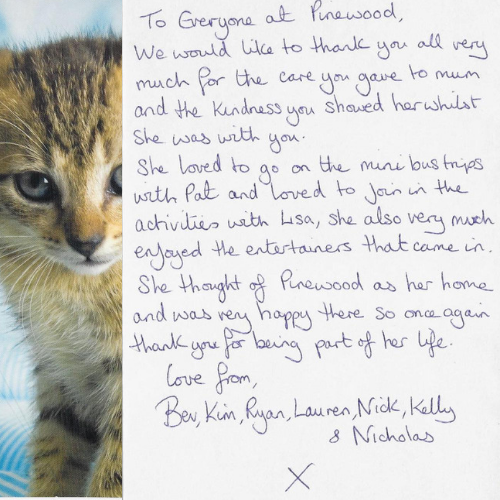 She thought of Pinewood as her home and was very happy there so once again thank you for being part of her life. 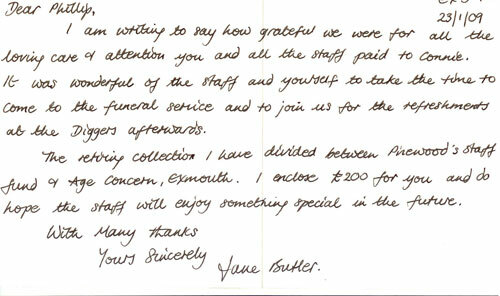 Thank you very much for looking after our mother Ida Bailey. Aurora & Brian Bailey and Family. To Everyone at Pinewood, re Lily. 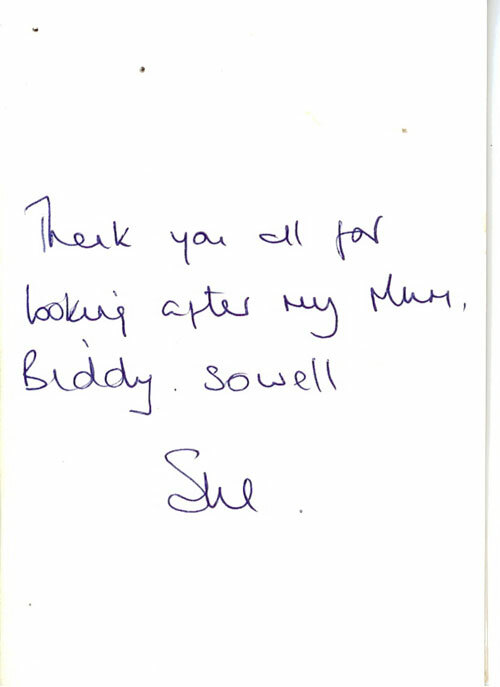 You are all in credibly special people and I cannot thank you all enough for looking after mum so well in her last 10 months. 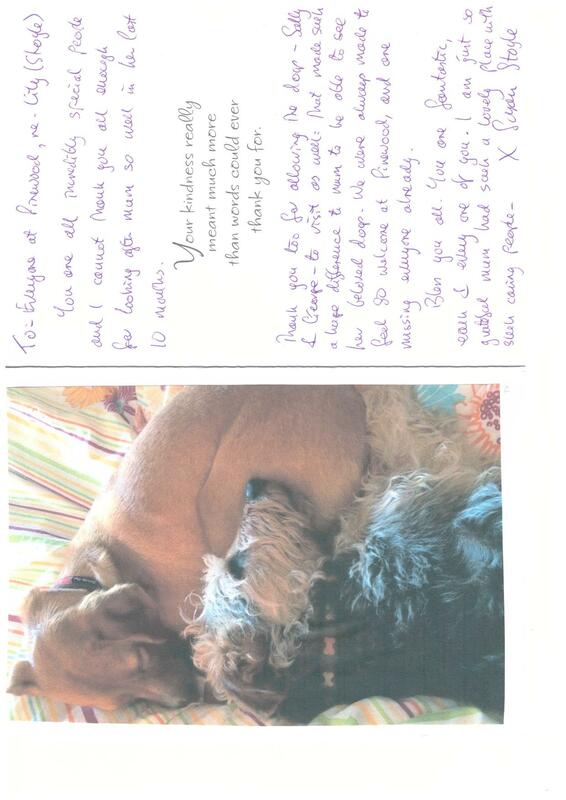 Thank you too for allowing the dogs - Sally and George - to visit as well; that made such a difference to mum to be able to see her beloved dogs. We were always made to feel so welcome at Pinewood, and are missing everyone already. Bless you all. You are fantastic, each and everyone of you. I am just so grateful mum had such a lovely place with such caring people. 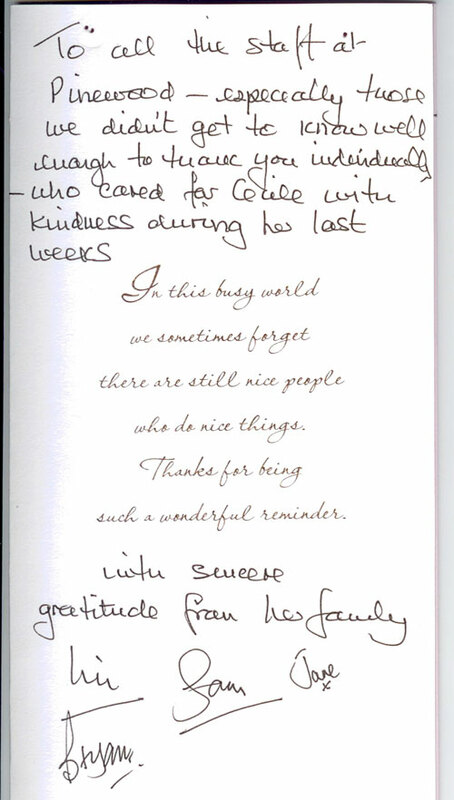 Thank you very much for al the care you have given to our dear mum and for your kindness and support for all of us over the last few weeks. Following the sad passing of my ex-sister in law, Mandy Wells, I just wanted to write and thank you for all the care and sensitivity you showed to her as well as to her visitors. 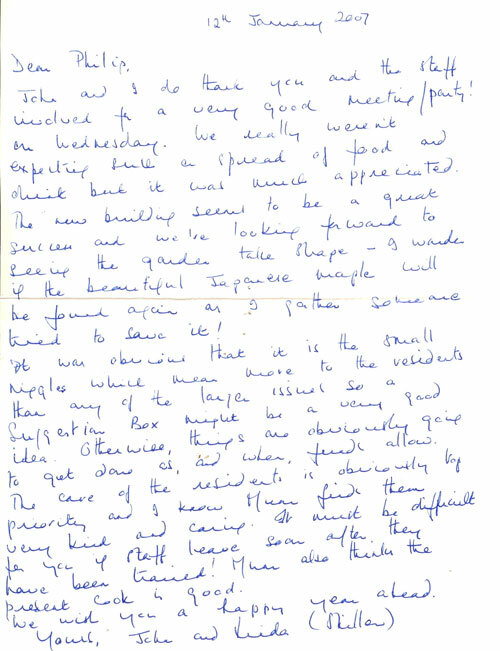 You were particularity helpful given the complexities of her family and I felt very reassured that you understood her needs as well as those of her visitors. 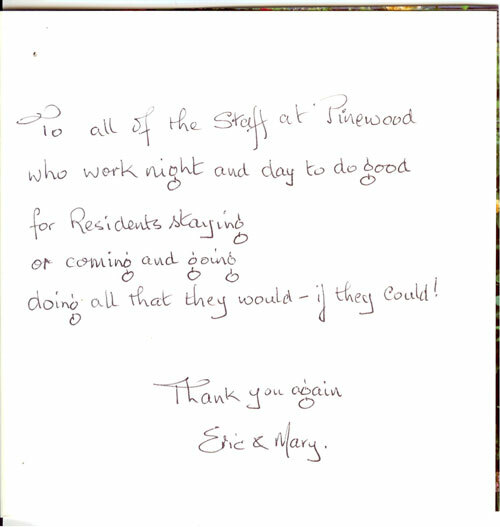 Pinewood always had a lovely, welcoming feel, both from staff and residents. 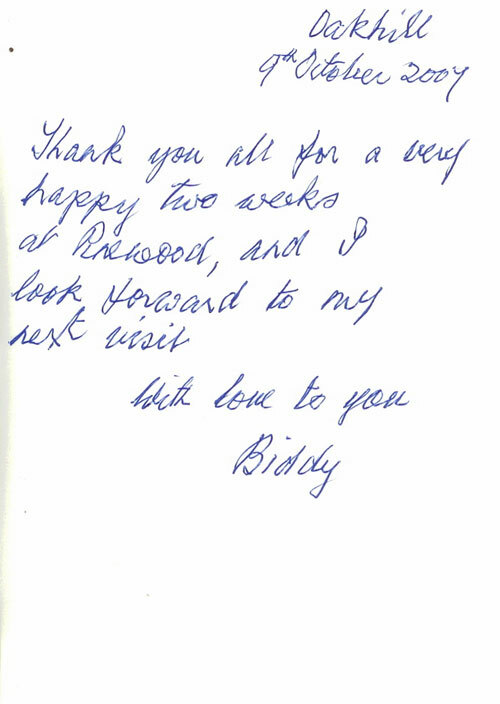 I congratulate you on a well run, caring nursing home and am so grateful that Mandy was able to be with you. Thank you so much for all the lovely photo's of Mummy's birthday celebrations which I have just picked up in your email on my return from Devon. I just managed to drive the three hours back to the Cotswolds ahead of the snow! Glad I took the risk and came down - so lovely to be part of everything. I didn't make up my mind to come until the last minute - hence forgetting my camera! I am therefore doubly grateful that we have a record, thanks to you! 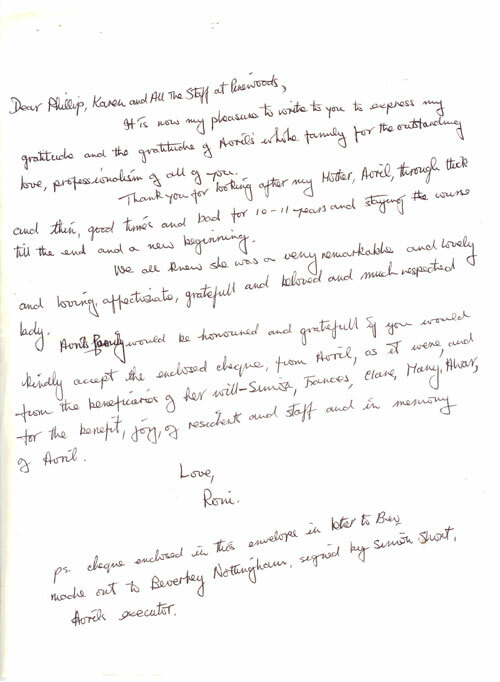 Whilst writing I would like to take the opportunity of thanking you and all the staff, not only for making her birthday so special, but also for everyone's care of her on a day to day basis. Rosemary and I appreciate everything you all do for her very much. All of you are so kind and patient with her and whenever I come down to visit I am always impressed with the way in which her dignity is protected and how loving and respectful you all are. All of this, when at times we realise circumstances can be difficult! Thank you all very much and a very happy and blessed New Year. Thank you for all so much for everything you do for Mum (Rita), we know that it's not always easy, but without you we'd be up a creek without a paddle. It is appreciated. Wishing you all a lovely Christmas and a very happy new year. See you on Christmas day. 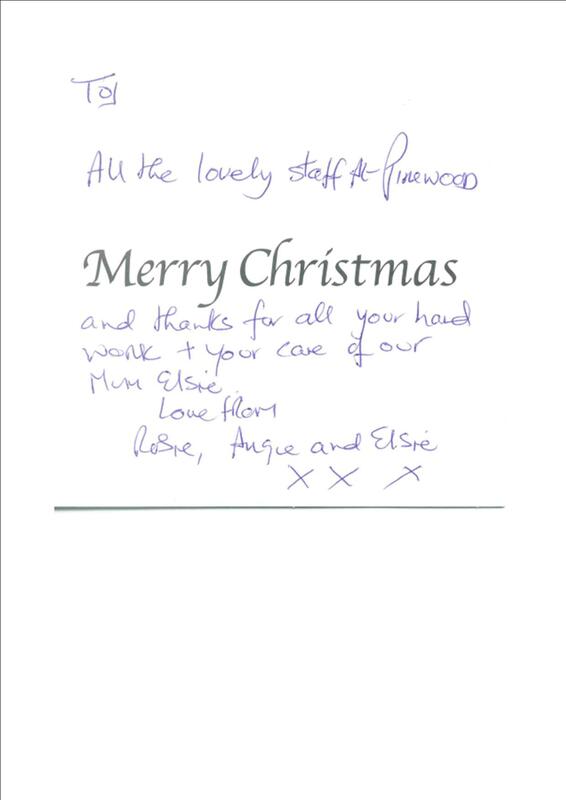 Merry Christmas and thanks for all your hard work and your care of our mum, Elsie. 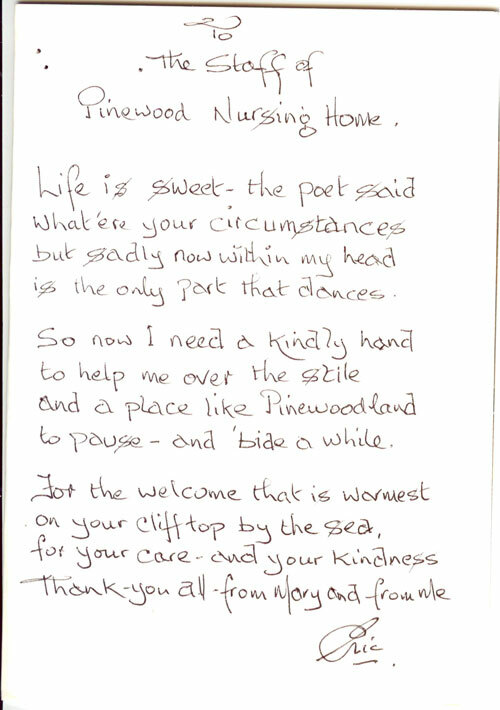 To all the Nurses, carers and catering staff at Pinewood. 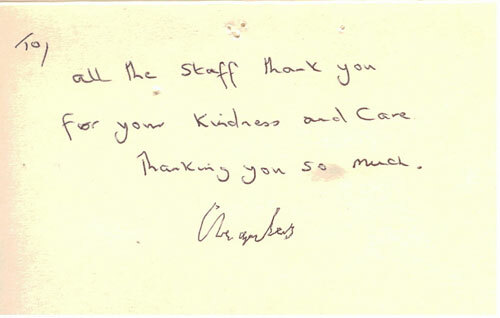 Thank you for all your support for Carol. We would just like to say such a very big Thank You for all the wonderful care you all gave Mum during her 3 years with you. It was all the little extra touches which made it such a special time when we know we could have found it all very difficult. 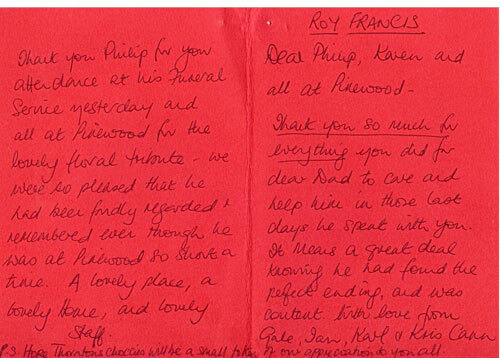 We were also made to feel part of the Pinewood family, and shall miss each and every one of you. You had all become such a big part of our lives. Thank you especially for making Mum's last few days so much easier for us - the endless cups of tea, coffee and meals were amazing - and the support afforded to us both was much appreciated. The end came much easier than either of us had anticipated, but you were there to guide us through - for which we shall be eternally grateful. We promise to pop in and see you all in the very near future and of course will bring a cake with us. 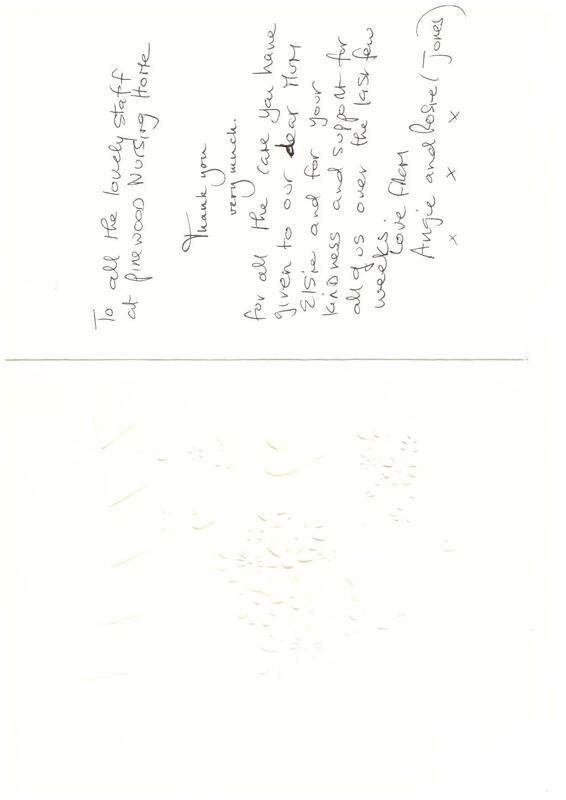 Pinewood Nursing Home StaffWe would like to start by saying a huge thank-you for all the wonderful care you gave Doug. He was only there for 4 wks but his care was second to none. Before he became poorly he would sing your praises every time we came up especially the fabulous meals, puddings and cakes. Never was ever too much trouble even when he became aggressive. He was always clean and dressed nice and not just left in his pyjamas. His room and bedding was always spotless and his clothes all nicely washed and ironed and the welcome given to his family was brilliant. So once again to everyone from the caretaker, domestic kitchen and laundry staff, the care team, the trained staff right up to Matron Karen and her deputy Helen. 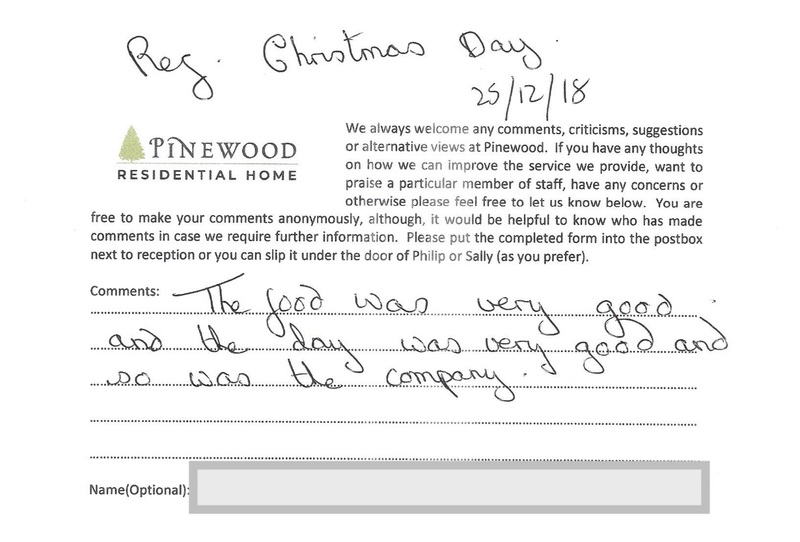 We didn't get to know all your names but it's obvious for all to see that you all pull together to make Pinewood a home to be proud of with a remarkable atmosphere, stunning views and No nasty smells. 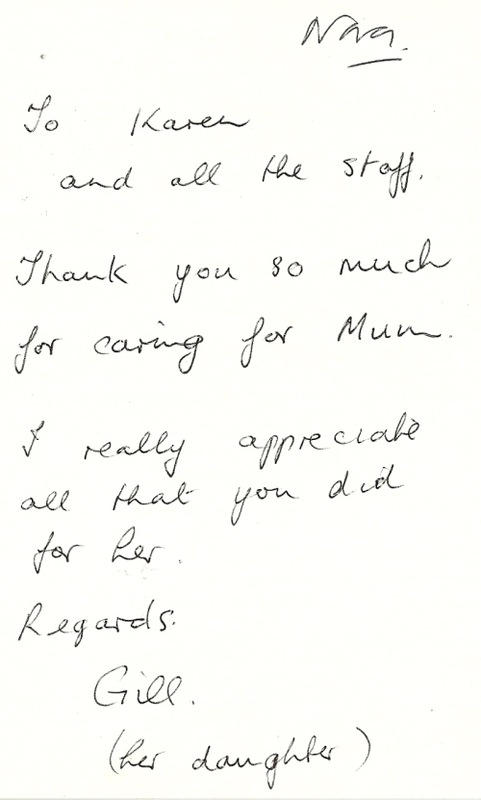 Thank you so much for caring for Mum. I really appreciate all that you did for her. and for all your help in every kind of way. To all the cleaners - and those who keep the books. For those who do the driving - and the entertaining. 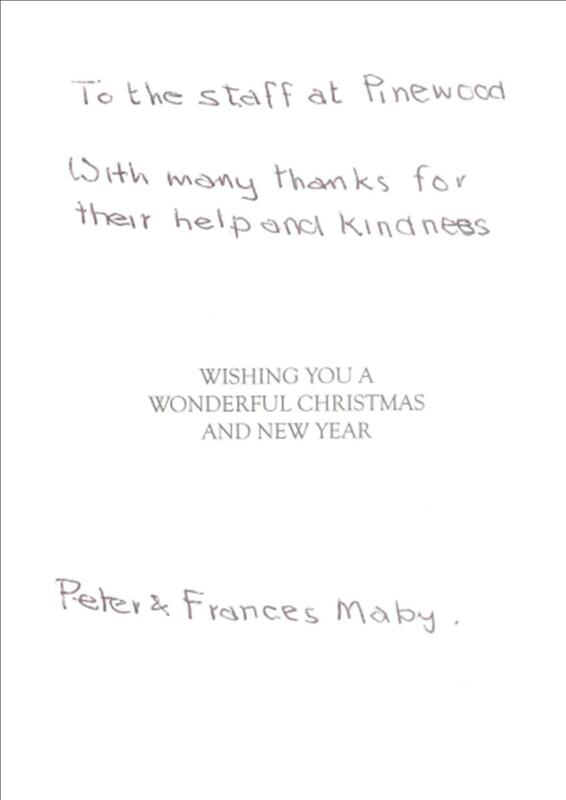 Thank you all from Mary - and from me. Thank you for your kindness and care. Thank you all for a very happy two weeks at Pinewood, and I look forward to my next visit. 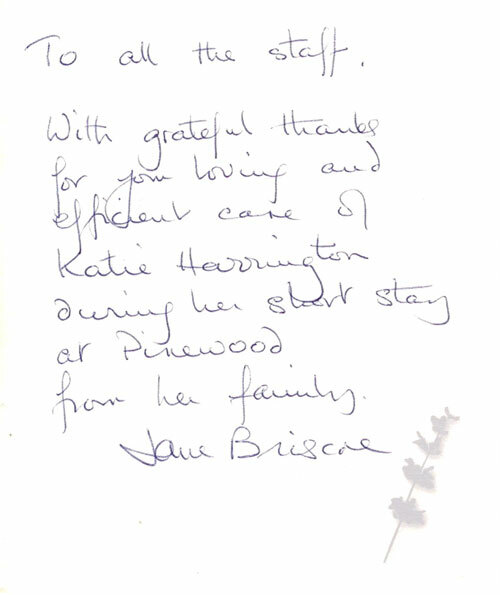 With grateful thanks for loving and efficient care of Katie Harrington during her short stay at Pinewood. 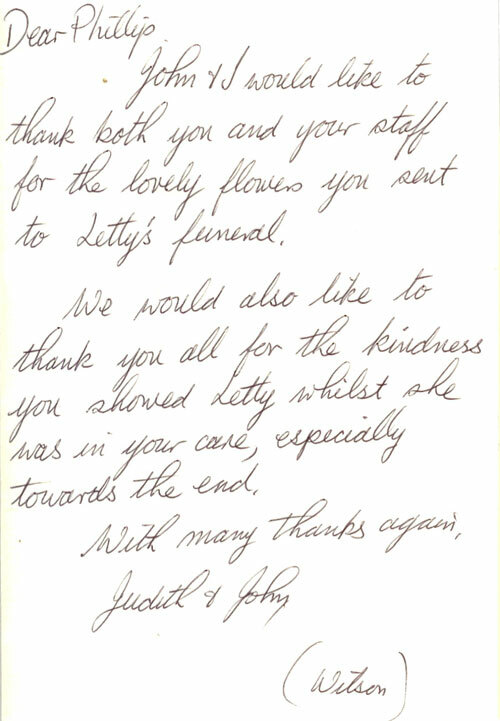 John and I would like to thank both you and your staff for the lovely flowers you sent to Letty's funeral. We would also like to thank you all for the kindness you showed Letty whilst she was in your care, especially towards the end. John and I do thank you and the staff involved for a very good meeting/party! on Wednesday. We really weren't expecting such a spread of food and drink, but it was much appreciated. The new building seems to be a great success and we're looking forward to seeing the garden take shape - I wonder if the beautiful Japanese Maple will be found again, as I gather someone tried to save it! It was obvious that it is the small niggles which mean more to the residents than any of the larger issues so a suggestion box might be a very good idea. Otherwise, things are obviously going to get done as and when funds allow. 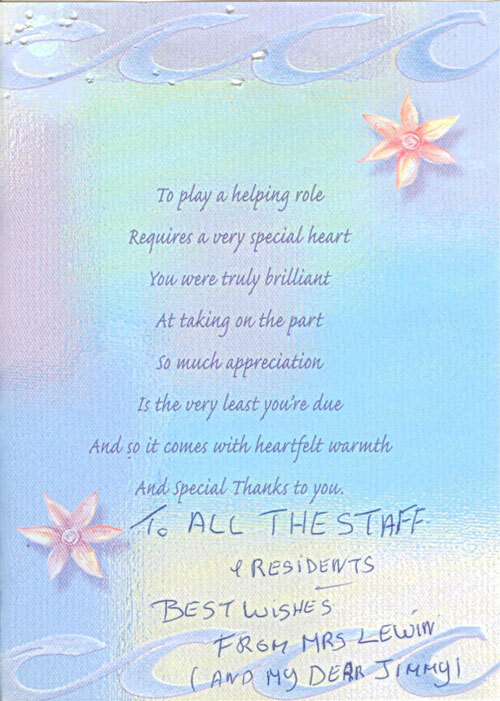 The care of the residents is obviously top priority and I know Mum finds them very kind and caring. It must be difficult for you if staff leave soon after they have been trained! Mum also thinks the present cook is good. We wish you a happy new year ahead. 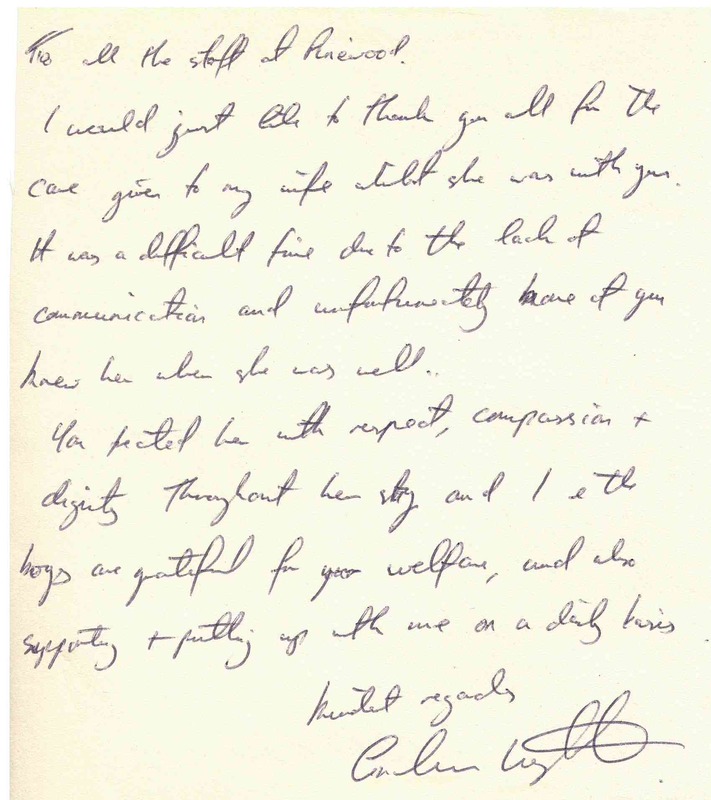 My husband, Ron, and I would like to thank you again for the loving care and attention you have given to our stepmother, Eveline, during the time she was with you, at times not easy, as we know. 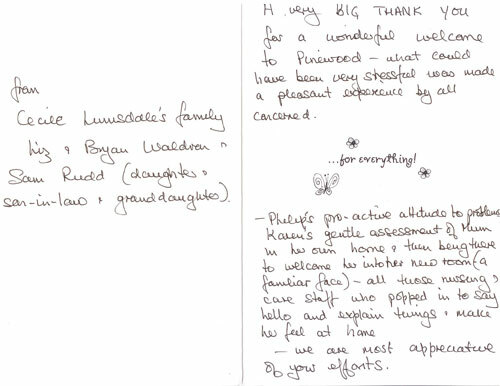 Lesley and Ruth have been especially kind and helpful, as indeed all the members of the nursing and caring staff have been, all of which we do appreciate. Eveline was very comfortable in her room, which is where she preferred to stay, as you know. 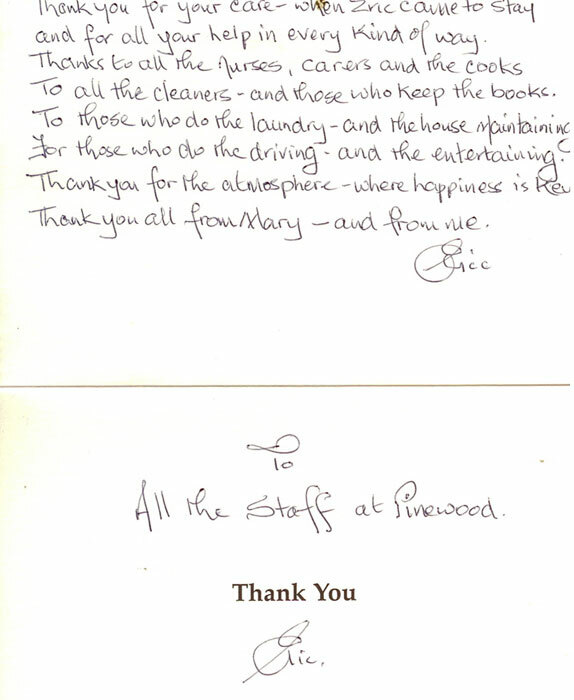 As a small token of our appreciation, please accept the enclosed cheque for Pinewood, to be used however you wish. Thank you for my mother's care. Even though she was not there long, she was beginning to settle in and like it. To Sue who made the splendid birthday cake and all who contributed to making my birthday such a happy one. I shall always remember your kindness. I would like to thank you and your staff for the quality of the care, and all the kindness and sensitivity shown to me dear wife, Eileen, who so sadly passed away in the early hours of Tuesday morning. Thanks to the vigilance of Bhundi and the carers, my daughter and I were contacted when Eileen's condition deteriorated in the evening, and were able to sit with her through her final hours until she slipped away peacefully, for which we will always be grateful. 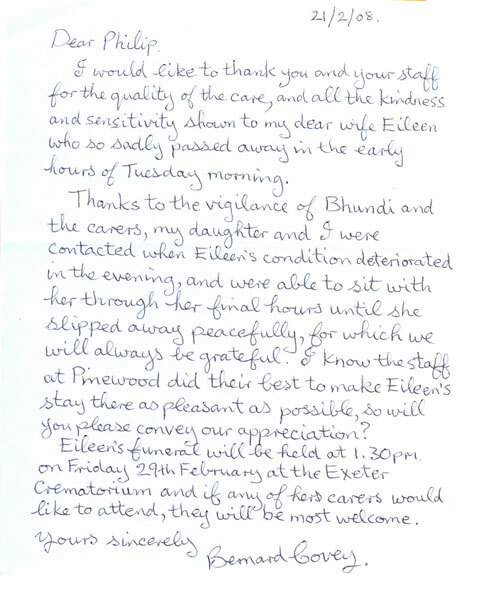 I know the staff at Pinewood did their best to make Eileen's stay there as pleasant as possible, so will you please convey our appreciation? Eileen's funeral will be held at 1.30pm on Friday 29th February at the Exeter Crematorium and if any of her carers would like to attend, they will be most welcome. is the only part that dances. to pause - and bide a while. 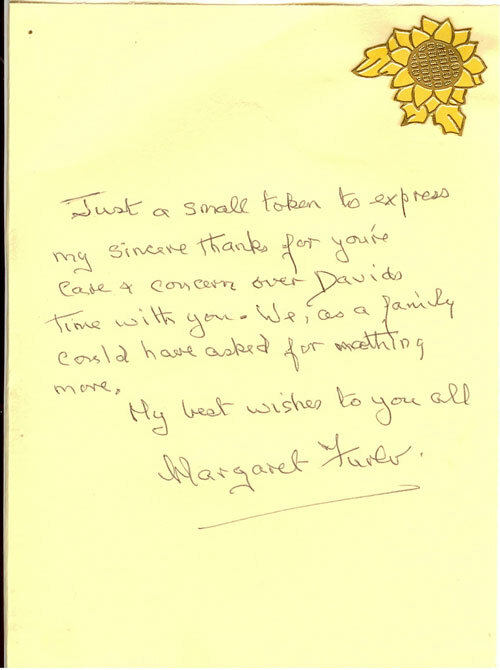 Just a small token to express my sincere thanks for your care and concern over David's time with you. We, as a family, could have asked for nothing more. Thank you so much for looking after Dad so well. Perhaps these chocolates will go some way to compensating for him being so difficult! Many, many thanks for organising Connie's day trip to see Adam Passing Out as an Officer at Dartmouth College. We know she had a wonderful time and it meant a lot that we were all there as a family. 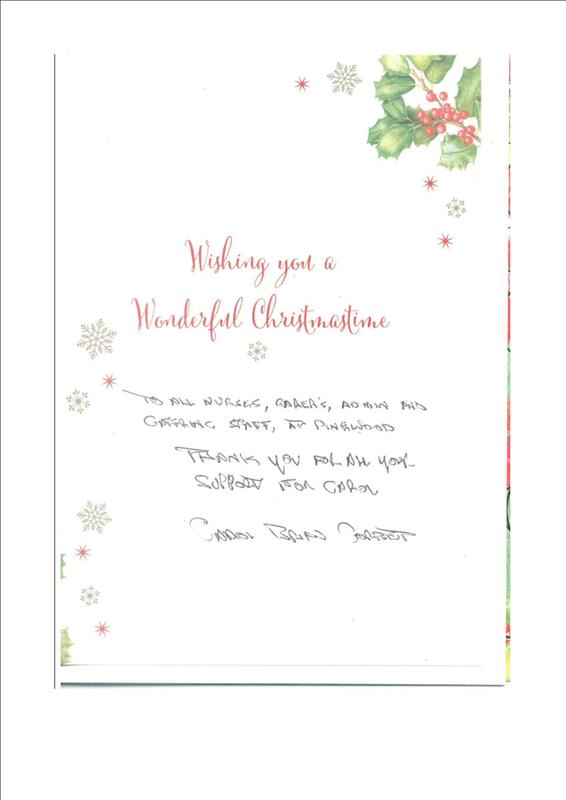 We really appreciate all you do - happy Christmas and New Year, and enjoy the biscuits. 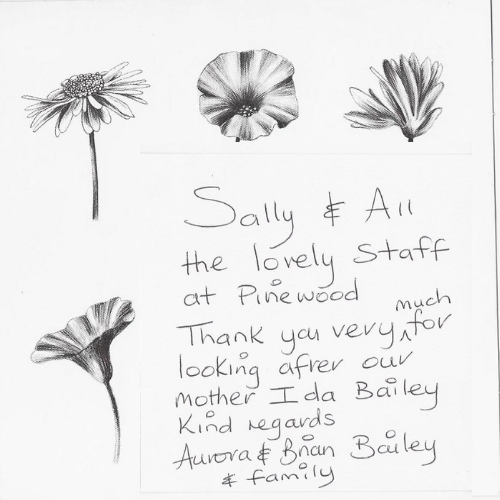 A very big thank you for a wonderful welcome to Pinewood - what could have been very stressful was made a pleasant experience by all concerned. 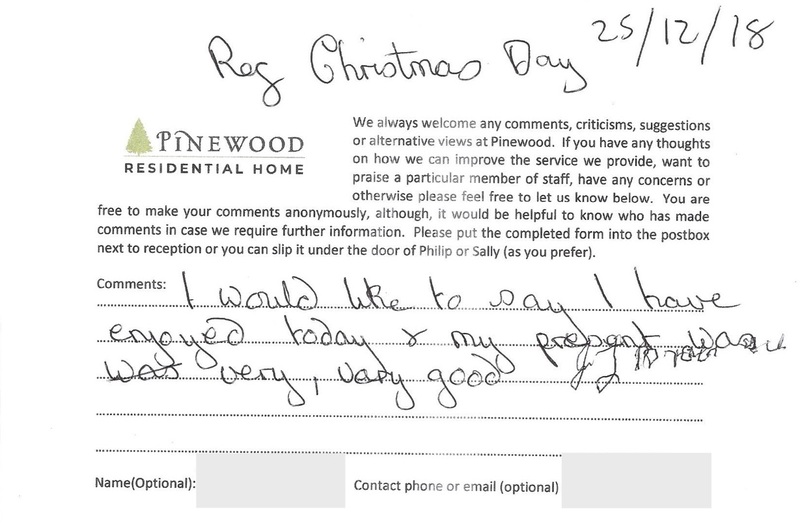 Philips proactive attitude to problems, Karens gentle assessment of Mum in her own home and then being there to welcome her into her new room (a familiar face) - all those nursing and care staff who popped in to say hello and explain things and make her feel at home - we are most appreciative of your efforts. To all the staff at Pinewood - especially those we didn't get to know well enough to thank individually - who cared for Cecile with kindness during her last weeks. With sincere gratitude from her family. And as special as you! 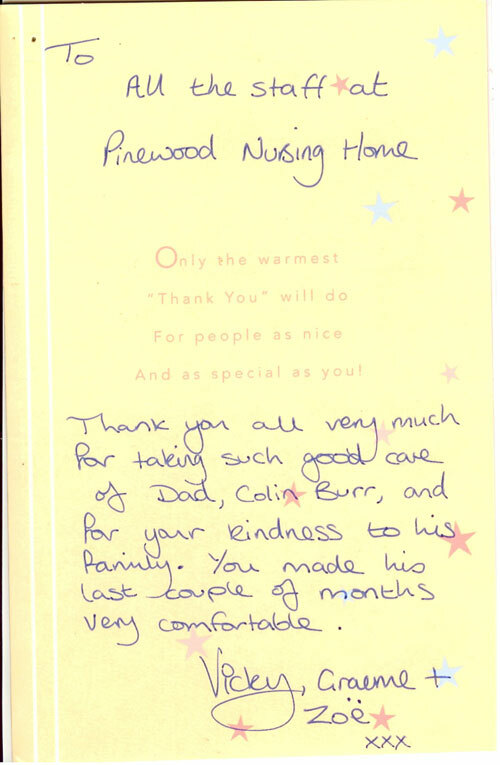 Thank you all very much for taking such good care of Dad, Colin Burr, and your kindness to his family. You made his last couple of months very comfortable. 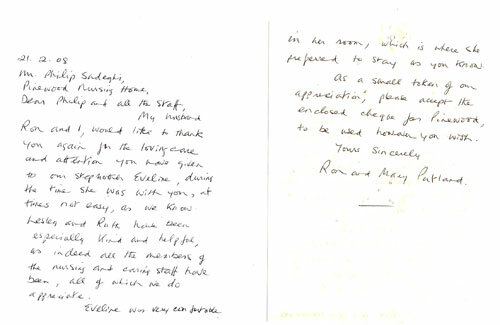 I am writing to say how grateful we were for all the loving care and attention you and all the staff paid to Connie. It was wonderful of the staff and yourself to take the time to come to the funeral service and to join us for the refreshments at the Diggers afterwards. The retiring collection I have divided between Pinewood's staff fund and Age Concern, Exmouth. I enclose �200 for you and do hope the staff will enjoy something special in the future. doing all that they would - if they could! It is now my pleasure to write to you to express my gratitude and the gratitude of Avril's whole family for the outstanding love and professionalism of all of you. Thank you for looking after my mother, Avril, through thick and think, good times and bad for 10-11 years, and staying the course till the end and a new beginning. We all knew she was a very remarkable and lovely and loving, affectionate, grateful and beloved and much respected lady. Avril's family would be honoured and grateful if you would kindly accept the enclosed cheque from Avril, as it were, and from the beneficiaries of her will, for the benefit, joy of residents and staff in memory of Avril. 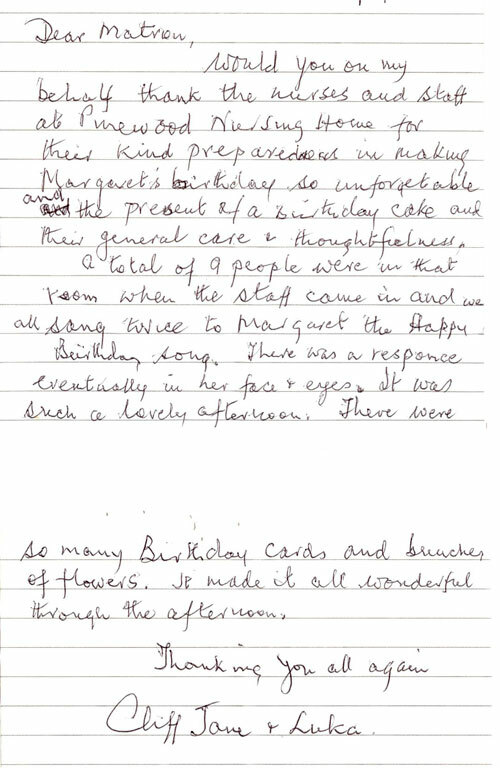 Would you, on my behalf, thank the nurses and staff at Pinewood Nursing Home for their kind preparedness in making Margaret's birthday so unforgettable and the present of a Birthday cake and their general care and thoughtfulness. A total of 9 people were in that room when the staff came in and all sang twice to Margaret the Hppy Birthday song. There was a response eventually in her face and eyes. It was such a lovely afternoon. There were so many Birthday cards and bunches of flowers. It made it all wonderful through the afternoon. Thank you so much for the lovely Birthday cake baked for Grandad Jack (Casey) and for all of your care on a daily basis. The Mayor and his wife stopping to have tea with Jack was unexpected and a real treat for him. Thank you. 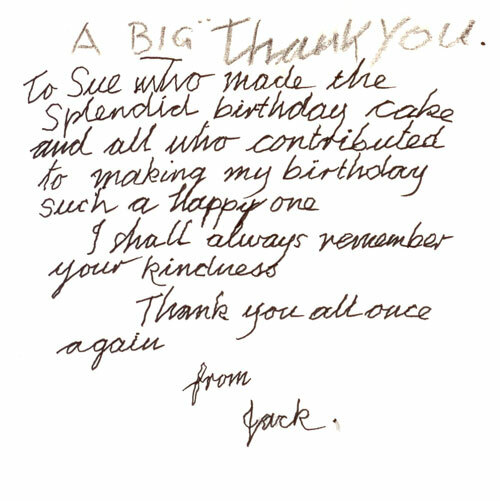 Thank you very much on Jack's behalf for the birthday gifts - if the magnifier helps him to read his own mail and TV Times it will make a huge difference to his daily life and we appreciate this generous gift from Pinewood. 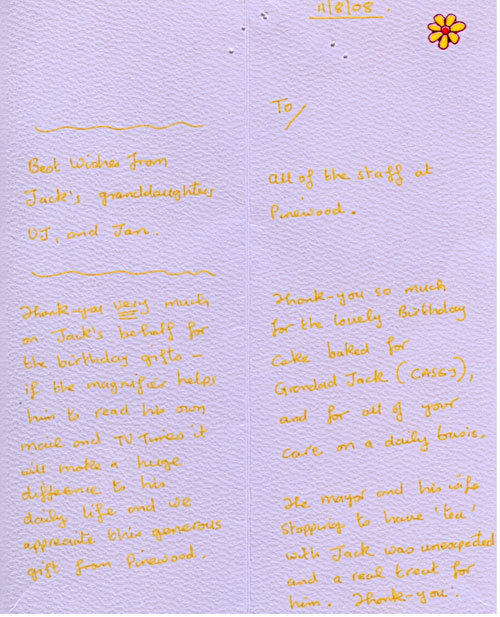 Best wishes from Jack's granddaughters. Thank you so much for everything you did for dear Dad to care and keep him in those last days he spent with you. It means a great deal knowing he had found the perfect ending, and was content. 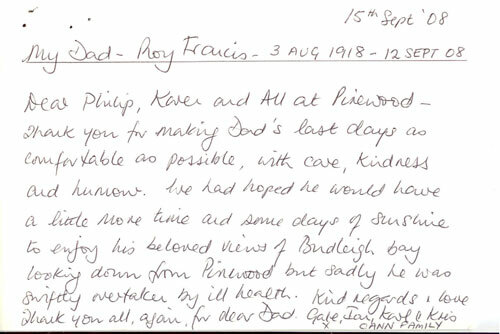 Thank you Philip for your attendance at his funeral service yesterday and all at Pinewood for the lovely floral tribute - we were so pleased that he had been fondly regarded and remembered, even though he was at Pinewood so short a time. 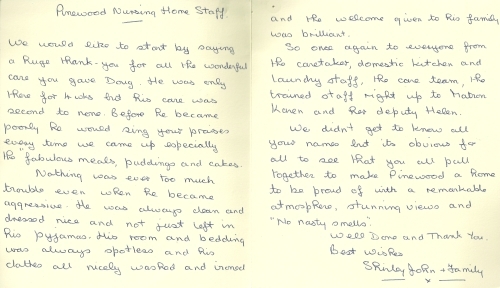 A lovely place, a lovely home and lovely staff. 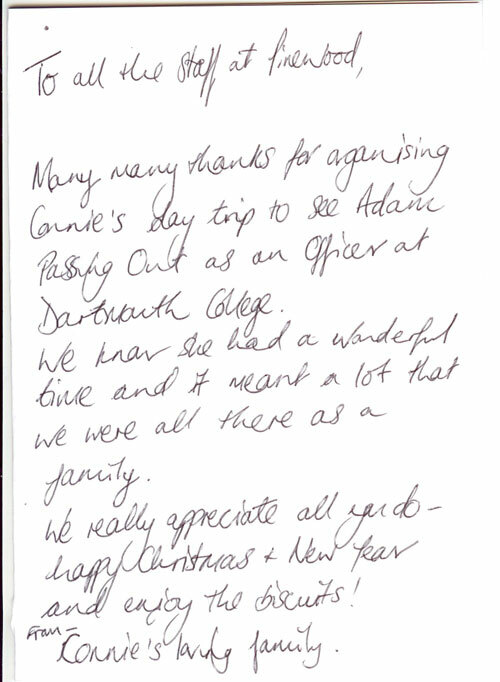 With love from Gale, Ian, Karl and Kris Cann. 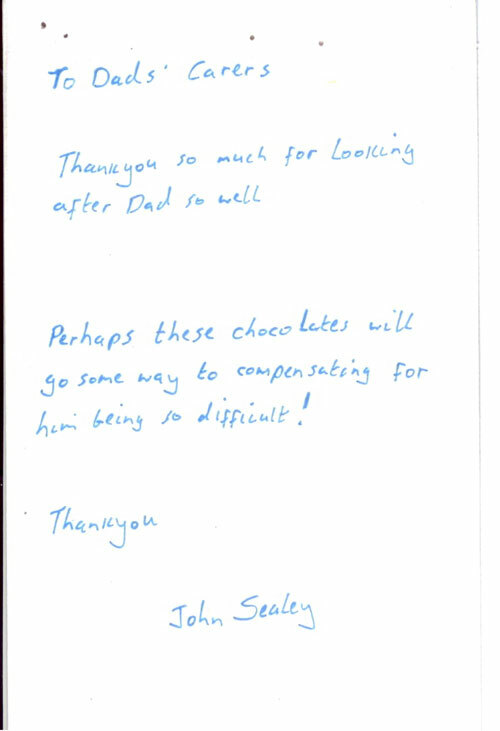 Thank you for making Dads last days as comfortable as possible, with care, kindness and humour. We had hoped he would have a little more time and some days of sunshine to enjoy his beloved views of Budleigh Bay looking down from Pinewood, but, sadly, he was swiftly overtaken by ill health. 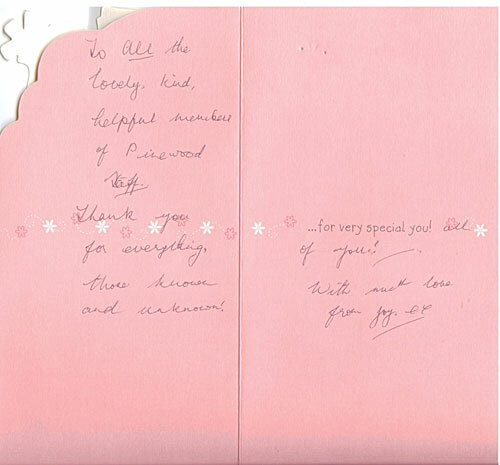 To all the lovely, kind, helpful members of Pinewood staff. Thank you for everything, those known and unknown. ...for a very special you! I would just like to thank you all for the care given to my wife whilst she was with you. It was a difficult time due to the lack of communication and unfortunately none of you knew her when she was well. You treated her with respect, compassion and dignity throughout her stay and I and the boys are grateful for your welfare, and also supporting and putting up with me on a daily basis. I would like to thank you for the lovely flowers which you sent me following my fathers death. It was very kind of Karen and Tracy to attend his funeral and I know he would have appreciated this very much. 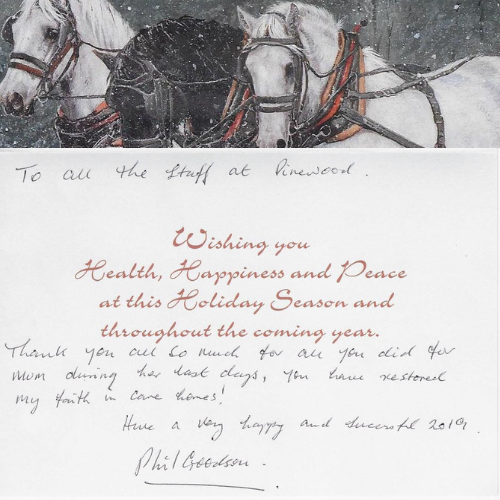 I hope that you and both the staff and residents have a peaceful Christmas. 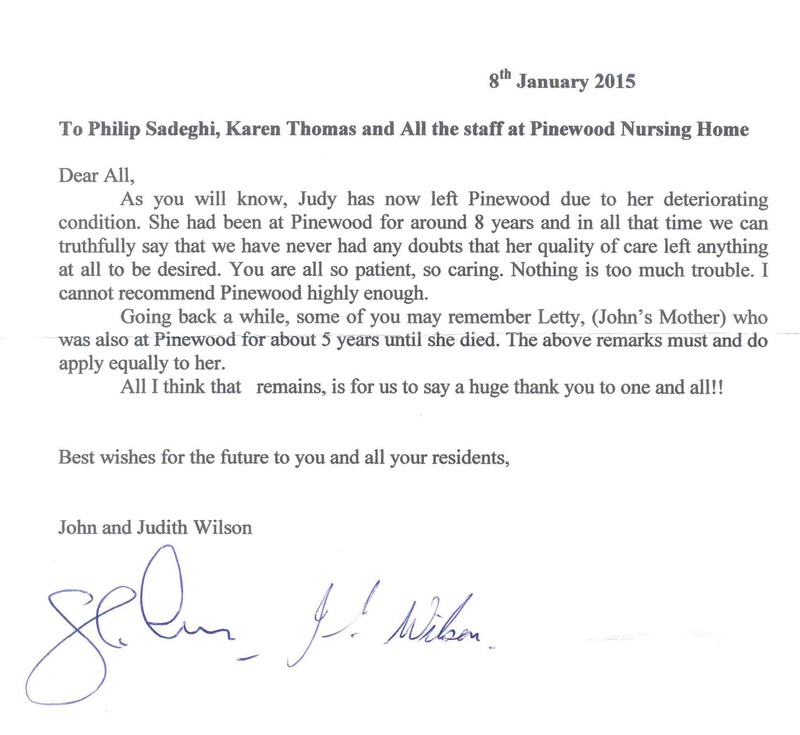 As you will know, Judy has now left Pinewood due to her deteriorating condition. 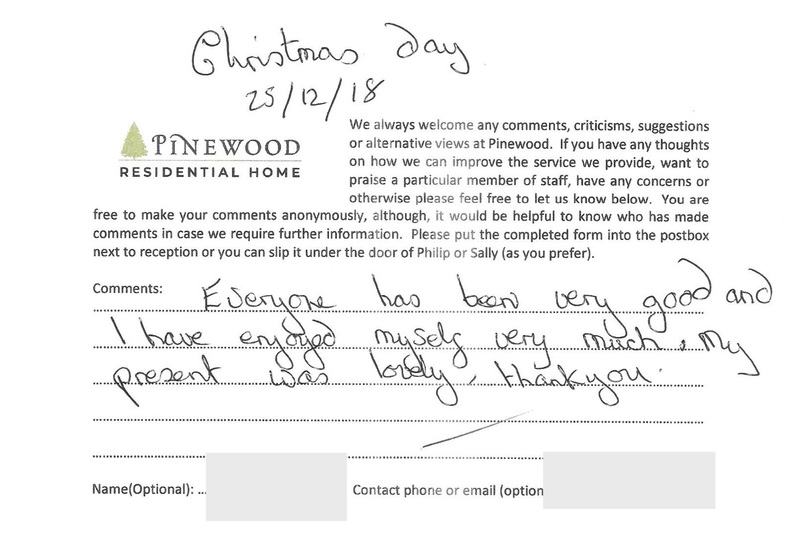 She had been at Pinewood for around 8 years and in all that time we can truthfully say that we have never had any doubts that her quality of care left anything at all to be desired. You are all so patient, so caring. Nothing is too much trouble. 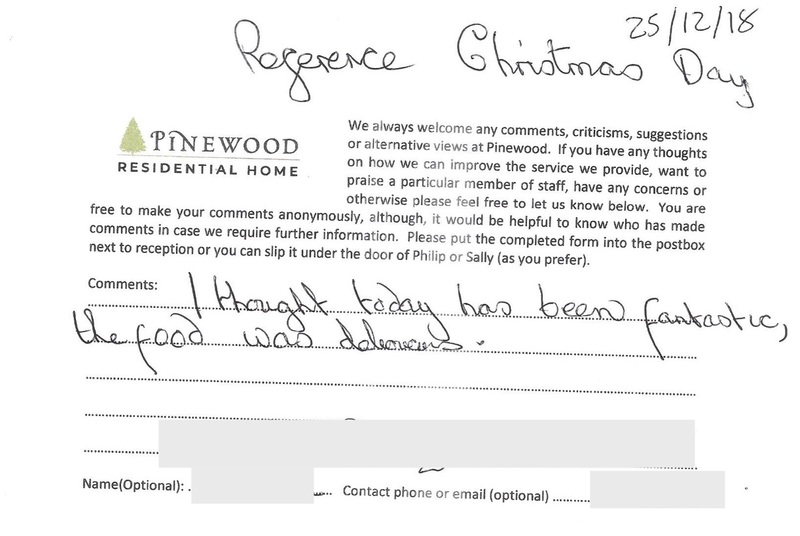 I cannot recommend Pinewood highly enough. Going back a while, some of you may remember Letty, (John's mother) who was also at Pinewood for about 5 years until she died. The above remarks must and do apply equally to her. All I think that remains, is for us to say a huge thank you to one and all!! Best wishes for the future to you all and all your residents. Thank you so much for making my birthday such a happy one. I especially like your singing of Happy Birthday. What a lovely evening of fireworks on Saturday. Much enjoyed by grandchildren and family too. You made a very difficult time enjoyable for our family. Thank you all, and Father Christmas and Mum's pressie! Keep smiling! 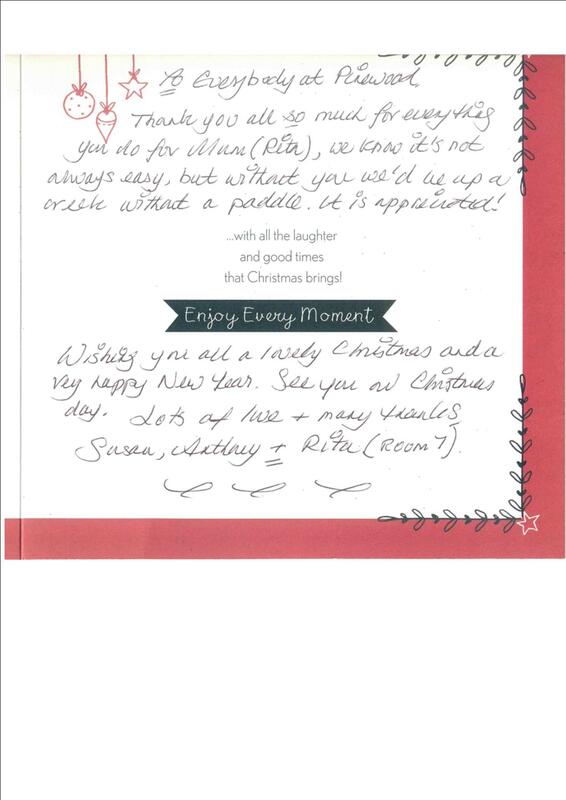 Love from Rita, Susan and Anthony. Dear Father Christmas, Thank you very much for the pyjama tops which you have Wally. He is looking forward to wearing them. With my best wishes, Marjorie. To all the staff at Pinewood, I would like to thank all of you for enabling my parents (Wally and Marjorie) to celebrate their 70th wedding anniversary on Tuesday. Everyone was so helpful and kind and even put up with our carol singing! Special thanks to Karen for allowing us to celebrate in Wally's room, to Sandeep for all his help with the coffees, champagne, delicious mince pies and cake, and of course the wonderful photographer - we really appreciate the many photos and video. I hope you all have a wonderful Christmas and 2016 is good for everyone. 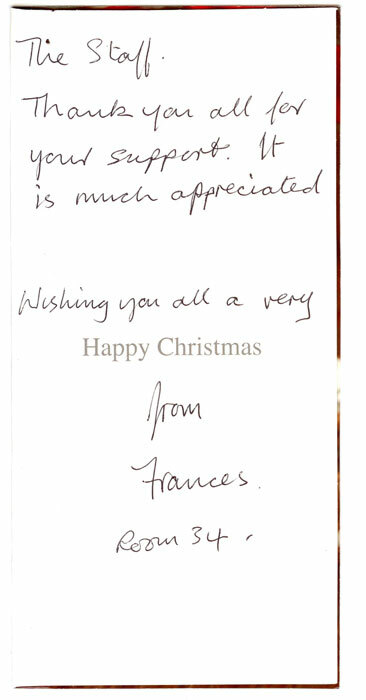 With best wishes form, Sandra Wakefield.